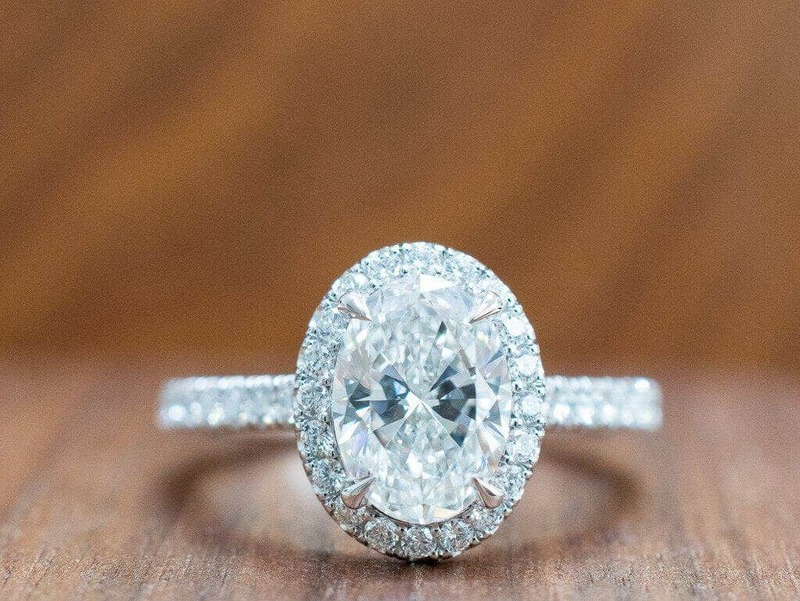 An oval cut is one of the more beautiful shapes a diamond can have. Expertly cut, faceted and polished, an oval cut diamond can be full of fire and sparkle. It is an excellent cut for many styles of engagement rings, pendants and other fashion jewellery. Ovals can be cut with varying amounts of facets to make the pavilion (bottom half of the diamond) more streamlined or wider and bulkier much like the hull of a boat. The more streamlined pavilion usually results in a diamond shape grade of ‘Oval Brilliant Cut’ by the GIA. This type of cut is generally regarded as the most brilliant, resulting in more sparkle and less dead or dark sections inside of the diamond. The bulkier style of cutting results in a heavier carat weight diamond with the downside of less sparkle and brilliance. More and more ovals are being cut to the higher standard of oval brilliant cut as customers have become more aware of the difference and the impact of a well-cut diamond. Who Should Wear an Oval Cut Diamond? This question is very hard to answer, as we feel the oval cut suits most finger types whether they be on the shorter or the longer side. The beauty of the oval cut is that it creates a long and elegant look which seems to compliment most finger types. Oval cuts can also make for great centre pieces in diamond earrings, pendants or bracelets. Though many solitaire rings have round cut brilliant diamonds, an oval cut diamond in a four-prong setting on a plain band of white gold, yellow gold or platinum makes a strong statement. We like to add a suggestion of sharpening the claws or prongs holding the diamond for a sleeker and more elegant look. In this style, the diamond is surrounded by smaller gemstones. These can be other diamonds or even coloured gemstones such as sapphires, rubies, peridots or citrines. Adding colour of the metal such as a yellow gold band can also add a nice bit of flair and contrast to the jewellery piece. 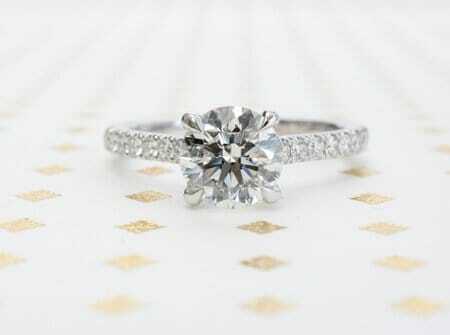 This style of engagement ring splits the shank, or band of the ring. The band is usually split into two, but it can also be split in threes and made to twist around each other or resemble vines or swirls. This is also called a fancy setting. The split shank is always decorated with smaller pavé diamonds, with the oval cut diamond as the central stone. Sometimes the central diamond is in a prong setting, though it might be in a bezel setting where it is held by a slender band of metal. This set may have an engagement ring set with an oval cut diamond and smaller diamonds and a simpler wedding ring. The wedding ring often has a dip at the top that accommodates the engagement ring’s diamond when they are both worn together. This ring has a large, oval cut diamond in the center with two gems on the side. These side gems can be any sort of gemstone or diamond of any shape. A daring example would have side stones of different colors or even different sizes. Three stone rings are classic and have a large impact. They carry a lot of diamond across the top of the ring which catches the eye immediately. This is a simple but sophisticated type of setting. It only requires the tension caused when two ends of the ring are forced open to hold the diamond permanently in position. An oval diamond is ideal for this sort of setting because the pressure of the two ends of the ring can be intense. A diamond, the hardest substance known, is hard enough to withstand the pressure without damage as long it is done by a trained and skilled professional. The decision to feature an oval diamond as your centre stone for your engagement ring is an excellent choice. It has a refined elegance that carries the ring extremely well. Oval diamonds have been popular for a long time and there is little concern that buying tastes will change drastically in the coming decades. That being said, this is a large and lasting commitment, so you should be sure about the diamond shape you decide to buy for your engagement ring or other jewellery.